This recipe for Taco Pie was originally posted in September, 2014. The photos were updated in March, 2018. 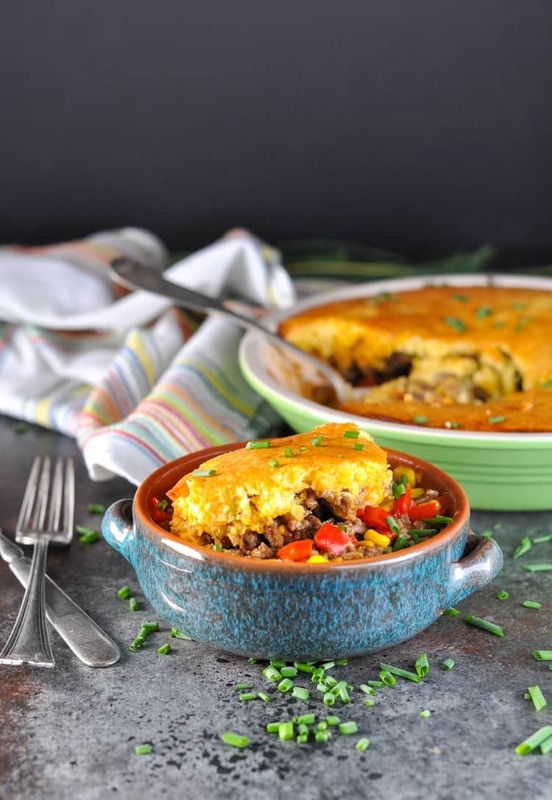 Like a Mexican version of chicken potpie, this Taco Pie is a fun twist on a favorite family dinner! 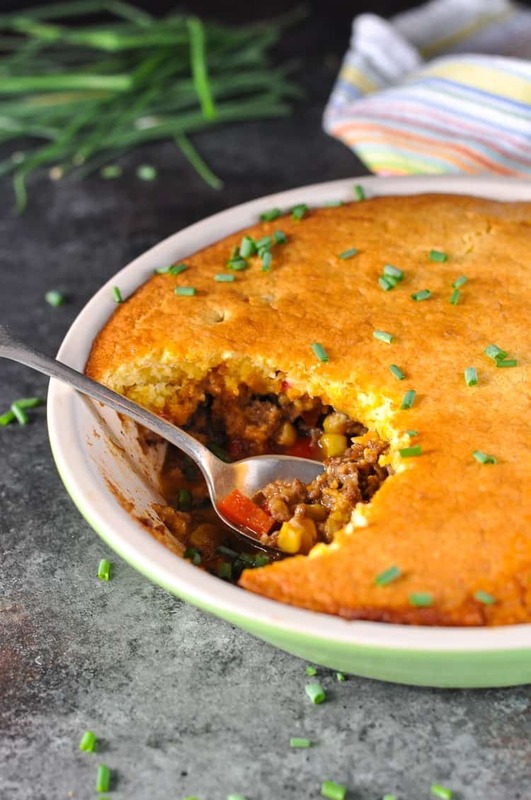 Meat, seasonings, corn, and peppers are topped with cheese and a cornbread crust for an easy weeknight supper. I’ve said on here before, my kids love Mexican food! And while tacos will always be a huge hit, sometimes it’s nice to mix things up a bit and surprise everybody with something new. That’s where this Taco Pie comes in! It has all of the same basic flavors of a regular taco, but they come together in an easy-to-eat dish that even little Spence can enjoy — no crumbly taco shells necessary! My easy Taco Pie is basically your Mexican-inspired dinner in casserole form — how could you possibly need anything more?! In a large skillet over medium-high heat, brown ground beef and onion until no longer pink. Drain. Return meat to the skillet and stir in taco seasoning mix, bell pepper, green chiles, and ¾ cup water. Reduce heat, simmer, and cook for an additional 10 minutes, stirring frequently. Add corn and shredded cheese during the final 1-2 minutes of cooking. Spoon beef mixture into a 9-inch deep-dish pie plate that has been sprayed with cooking spray. In a medium bowl, combine corn muffin mix, egg, and milk and mix well. Spoon batter over top of pie. Bake for 20 minutes, or until top is golden brown. If the topping starts to brown too quickly before it has cooked through, just cover the top lightly with foil and continue baking. This looks so good! We eat a lot of Mexican food in our home, so I am always looking for a new, fun way to enjoy the same flavors. I especially love that this can be prepared mostly in advance. Thanks so much! Pinning it now. Blair, I love this! I make some very similar but call it enchilada pie!! Your’s is definitely prettier. I love the corn muffin mix!! Will be trying your version soon! Thanks. I love this concept of taco pie. Seems easy to make and tasty! 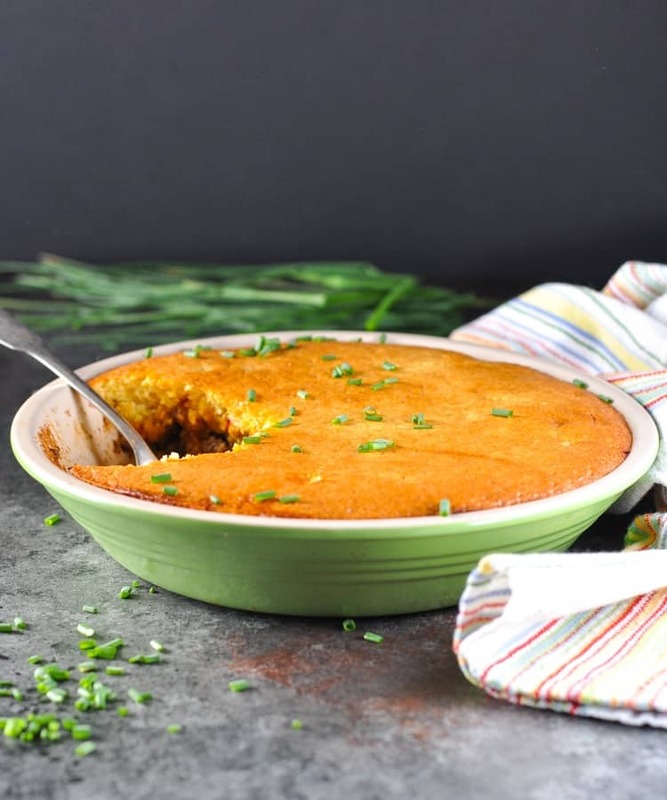 Usually, we use masa for but the corn bread sounds like an interesting alternative. Thanks, Bill! The crust is definitely easy, and I love that it adds a tiny bit of sweetness to contrast with the salty meat and cheese! I pinned this to try soon! What a delicious looking meal! I love Mexican food! That’s great! Thanks so much for the pin, Julia. I hope that you love it! Hi, Serene! Thanks so much for stopping by, and thanks for the pin! I love the corn muffin topping! I bet that really adds something special. By the way, I am seriously impressed at your pictures. Ground beef can be so unflattering in a picture but yours looks great. Pinning. Visiting from Merry Monday. I’m new to your blog. I pinned this and plan to try it soon! Hi, Melissa! Thanks for visiting…I’m so glad that you found the blog, and I appreciate your pin! My kids love tacos so I know this will be a huge hit! Thanks for sharing it with us at Foodie Fridays! 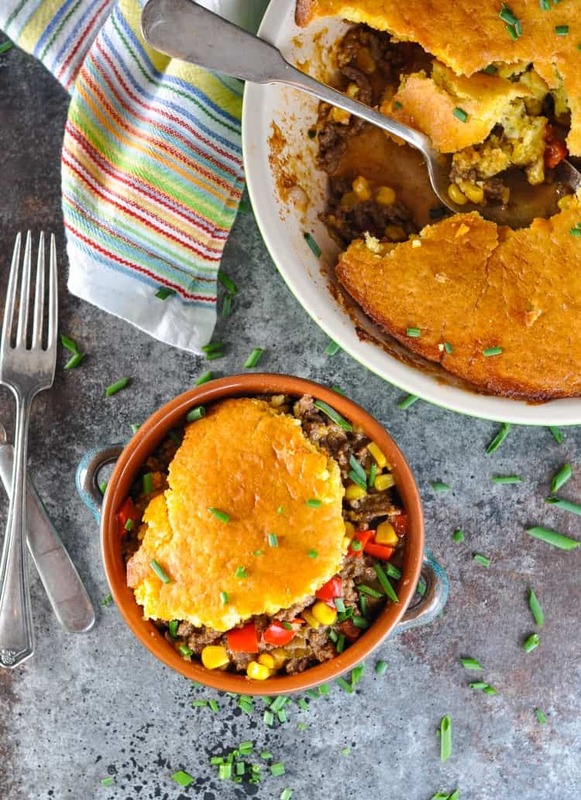 I’ve never tried taco pie but it looks incredible! Thank you so much for linking up at Tasty Tuesday! Your recipe has been pinned to the Tasty Tuesday Pinterest board! Please join us again this week! Mexican food is a favourite of mine, this looks like a great meal. Thanks for linking up to Sweet and Savoury Sunday, stop by and link up again. Have a great day!! My mother in law used to make a dish that was similar to this one. I loved it. This recipe looks every bit as good. Thanks for sharing at Foodie Fridays. Hope to see you there again tomorrow! I forgot how good taco pie can be. Pinned. Thanks for bringing this to Weekend Bites. I made this tonight, and will make it again! The recipe didn’t say to drain the chopped green chiles, so I didn’t. I probably will next time. The topping was scrumptious, but I would prefer a slightly thinner crust, so will probably adjust that too. It’s a wonderful recipe, and it came out of the oven looking just perfect!! Thank you for sharing. Thanks for letting me know, Corinne! I’m so glad that you enjoyed it! I cannot wait to try this! This looks amazing! 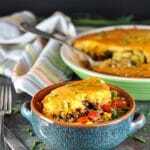 My husband loves Mexican AND.m cornbread but I get bored and usually like to add a twist! Thanks for the great idea! Wonderful! So glad that it was a hit, Patricia! 🙂 Thanks for letting me know!